Paris 1913, and the fashion magazine of choice for the city’s bright young things was the Journal des Dames et des Modes. A century on, us lucky Dublin dwellers have the opportunity to see what was so inspiring about this short lived publication. Costumes Parisiens: Fashion Plates from 1912-1914, currently running at The Chester Beatty Library, showcases the exquisite prints that illustrated the magazine during those last years of what was known as the Belle Époque. Edith Dunn – already a renowned collector of French Impressionist and Post-Impressionist paintings before she became the second wife of Chester Beatty – persuaded her future husband to acquire the Journal, among other fashion periodicals. 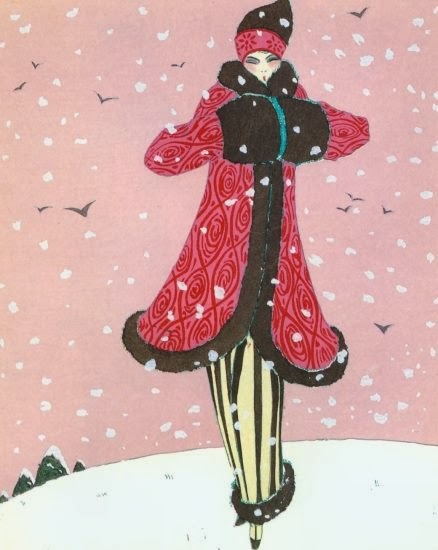 Many of the almost 150 prints bought by him are now on show in the Library that bears his name and are testament to how these illustrations were the interface between fashion and art. The work of artists including Erte, Georges Lepape, Louis Barbier and Paul Iribe featured prominently in the pages of the Journal, indicating that fashion was an important element of the whole decorative arts movement. What do these charming prints tell us about how the fashionable women of a century ago dressed? Back then, the most important accessory for a woman enamoured of haute couture was a wealthy husband, or papa, linked on her arm. According to the Library’s research, the ladies-who-lunched during that pre-war period could spend thousands of pounds per month on the latest fashions. Chester Beatty’s first wife, Ninette, is reckoned to have spent an average of $850 a month in 1910 on the family’s wardrobe, with even the servants decked out in specially designed livery. As for the garments, the most fashionable silhouette of the Belle Époque was a flowing, draped line which was radically different from the corseted, restricted style of the late Edwardian era. 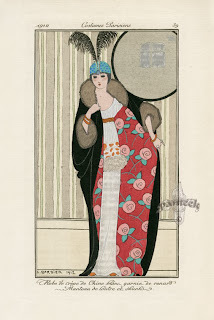 Paul Poiret, the first couturier to use draping in his designs, remarked that the exaggerated 'S' shape of the late 19th century made a woman “look like she was hauling a trailer.” He took credit that his empire line dresses “freed the bust” and negated the torture of the whalebone corset. and the exotic evening fashions paid more than a passing nod to Diagilev’s Ballet Russes which had arrived in Paris to great sensation in 1909. 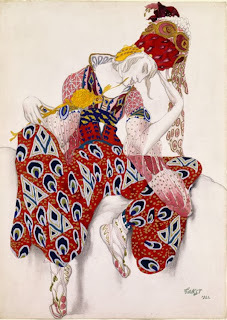 Along with Leon Bakst’s costume designs for the ballet, there was also the influence of even farther East, in particular, les Japonais. Époque – the opera coat. Because columnar evening dresses were of flimsy silk or muslin, it was necessary to wrap up for an evening out in one of these coats – also known as cocoon coats – which were often fur lined. 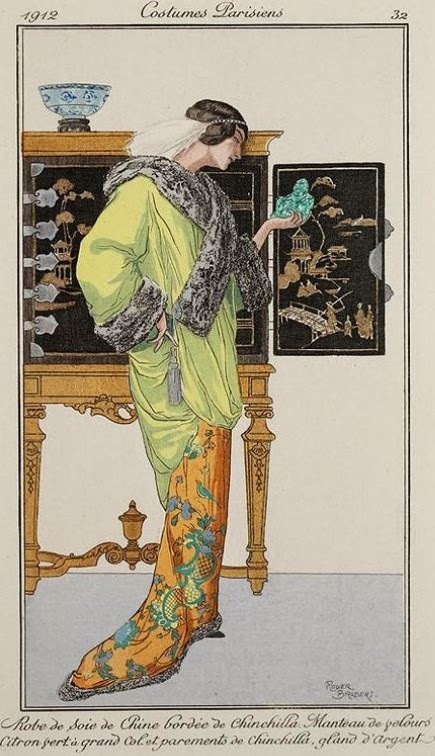 That kimono shape of inverted triangle – broader at the shoulder and tapering down to a narrower hem – is also apparent in the fashionable coat shape of winter 2013 (referred to recently in The Guardian’s fashion pages as ovoid), but in a much shorter version. What hasn’t changed either is that the biggest buyers of haute couture these days remain the extremely wealthy with a loaded husband or father in tow– currently, Saudi wives and princesses. But for anyone with an interest in fashion’s ephemeral history, or just needing to escape the noise and bustle of Christmas shoppers on the city streets, a visit to the Chester Beatty’s Costumes Parisiens is a calm, informative haven. And totally free.